Both the political and the cryptocurrency spheres alike are talking about the Harapan Coin, a donation token endorsed by Khalid Abdul Samad—our current Federal Territories Minister. It was created as a fundraising coin for the Pakatan Harapan coalition to combat Barisan Nasional in the 14th General Elections. According to Malay Mail, Khalid has expressed an interest in bringing up the Harapan Coin, originally a personal project, in an upcoming PH Presidential Council’s next meeting. At the time of writing, the Pakatan Harapan government has not expressed any opinions or endorsement of the Harapan Coin, apart from Khalid Samad who intended to use the coin to garner donations for his Parti Amanah Negara, member of the Pakatan Harapan coalition. Seeing that the Harapan Coin is a relatively unique presence in any market, we thought that it would be worthwhile to look into this coin that has recently garnered interest, and outline some discoveries. Disclaimer: The Harapan Coin was initially issued to raise funds prior to the Pakatan Harapan victory at GE14, and there are no discussions on whether they will continue it or not. All information presented is about the coin’s intentions before the elections. The coin came into being partly because it was otherwise difficult for those outside of Malaysia to transfer large sums into the then-opposition’s wallet. BNM would curb any suspicious transactions from coming in overseas, according to one of the core team members of Harapan Coin. The Harapan Coin website indicates that out of the intended US$120,000,000.00 they hoped on raising, they gained a total of USD2,548.44. That’s less than 1% than the amount they hoped to raise. There was interest in turning the Harapan Coin into a legitimate currency in Malaysia, but this is probably unlikely any time soon, as BNM and Securities Commission has not expressed any endorsement or legalisation of cryptocurrency be it as payments instrument or a securities token at the time of writing, and seem wary of raising ICOs in Malaysia. Based on Khalid Samad’s statement in the video, 30% of the funds were to be given to the developer, 30% for the Parti Amanah Negara, and the rest was to be given for Pakatan Harapan. Though in a Facebook post, the developers claim that they will not be taking their own cut of the donations raised. Some netizens have wondered about the legitimacy of the video. The editing choices that would have made it easy for an unscrupulous scammer to put words into his mouth. As far as Fintech News Malaysia is able to verify though, the Harapan Coin is indeed endorsed by Khalid. 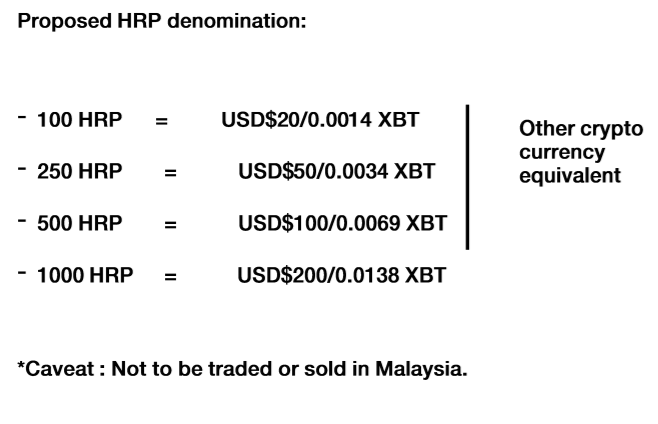 Screenshot from the Harapan Coin white paper. The first issue we found when delving into the white paper is that it takes 22 pages before you get to any concrete information about the Harapan Coin, or HRP. The white paper was seemingly too concerned with explaining the Malaysian political history in detail, and outlining a beginner-friendly guide on decentralisation, ICOs, and why blockchain is incorruptible. Many ICO white papers choose to assume that people already understand what those in the know consider basic information. For example, when we looked at HelloGold’s ICO white paper, it only takes them 2 pages of backstory and company information before they delve into technical details of the coin. That being said, we admit that this practice is not unheard of. DAOstack’s successful ICO, which only took 66 seconds to sell out, detailed what blockchain and decentralisation actually means, though they did also go into more technical details about the coin later on, which the HRP notably lacks. Considering that this coin is intended for those already interested in Malaysian politics, perhaps it could have stood without a crash course into Malaysian political history, and instead focused on the problem at hand that the HRP was trying to solve as well as the underlying technology. It was always made clear that the coin exists for donation purposes, rather than rewards. One of the core team members reportedly wanted to send in a “huge amount of money” for GE13, but Bank Negara stopped the money from reaching Malaysia, in a bid to stop suspicious money coming from overseas. This Harapan Coin was intended as a decentralised solution that could circumvent such problems. And with the general elections coming up at the time with a deadline, the intended recipient might not have the time required to go through the bureaucratic red tape to get those donations in time, which perhaps in Khalid’s thoughts, necessitated the coin. That being said, some of the more recent marketing strategies do concern us slightly, particularly with statements like “Harapan Coin will fly high. Do not regret for not buying now!” posted on the 6th of July. Screenshot of their Facebook page. Since the Harapan Coin was always intended to be a method of donation, the rewards structure is a tad unclear and perhaps pending Khalid’s talks with the ruling government. 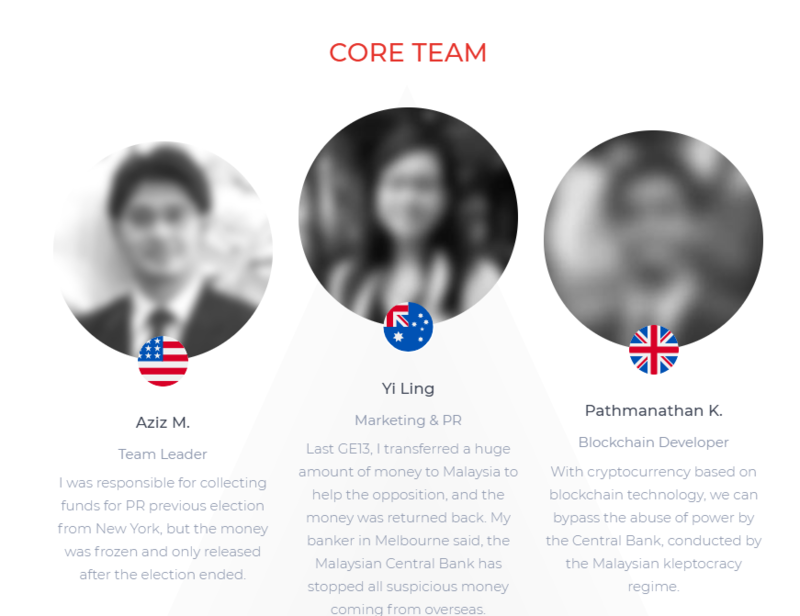 Since the coin’s inception, the Harapan Coin team has remained mysterious, which according to their website is “for utmost security as not wanting to be tracked by BN Malaysia’s special branch department, we have no choice but to blur our facial pictures”. The flags accompanying each name and blurred photo seem to indicate where these developers are currently residing in. We doubt that the authorities in these countries would allow the then-ruling Barisan Nasional government to take action against these individuals as long as they are there. That being said, we could perhaps give them the benefit of the doubt that they’d rather be safe than sorry. All in all, this coin ended up appearing more legitimate than we initially anticipated when we first heard of it. That being said, we also understand why the coin might not have been as celebrated as the team and the minister might have initially hoped. A mysterious team perhaps did not help matters much, ringing ‘scam’ bells for many who would otherwise be interested. And with a white paper that was vague on the technology underlying the coin, investors were predictably unsure, and perhaps fearing that their donation would go into the pockets of scammy developers, held back. It bears repeating that BNM wants Malaysians to be wary of any ICOs they may want to buy. As such, it might be unwise for a political coalition to affiliate themselves to a cryptocurrency. So Khalid Samad may have the best of intentions when the Harapan Coin promises were made, but others in the ruling government might not be too keen on it. It’s heartening to see someone in the administration looking into new technology, but it would perhaps be fruitful to study what are some triggers into the new market one is exploring, and how you would present yourself as a legitimate extension of your efforts.